Attractively housed in durable stainless steel, this ultra-convenient toaster oven features convection technology for faster, more thorough cooking. The unit's spacious interior can hold up to six slices of bread at a time or a 12-inch pizza, while its digital display makes it simple to set the temperature from 150 to 450 degrees F. Choose from a variety of cooking functions including bake, broil, toast, pizza, and dehydrate. A 60-minute timer with automatic shut-off and a bell signal provides added convenience, while an auto-advance rack allows for safely removing cooked foods. Other highlights include an interior light, cool-touch handles, and double-wall construction for enhanced cooking performance and heat retention. Accessories include a durable baking pan and broiler insert, two removable/reversible chrome-plated cooking racks, a removable crumb tray, and a recipe book. The toaster oven measures 14 by 22 by 16 inches and carries a one-year limited warranty. While I found this toaster oven to be more convenient than using the oven, its controls are not particularly intuitive, and it feels cheaply made. I tried baking a pie in it, and one side was much darker brown than the other. This oven also used too much counter space for the amount of cooking space it offered. The roundness wastes space. I've had this toaster for a while now, and dislike it. While it is very flexible, I need my toaster to be a good toaster first and foremost. And by that benchmark, it falls short. It's slow! TERRIBLE controls. Otherwise mediocre toaster oven. Decent sized toaster with some of the most horrible controls you could possibly think of. There are no knobs for anything. A "correctly" designed toaster oven would have one knob for temperature, and one for a timer. This one defaults to 30 minutes and 300*F temperature. To fan-bake something at 450*F for 10 minutes, I'd have to press the "oven" button twice, then the "Down" button about 20 times to change from 30 minutes to 10, and then the Timer/Temp button to switch to the temp controls, and then press the "Up" button about 5 times to reach 450*F. Then I have to press start. On any decent toaster oven, all of this would involve twisting two knobs. Whoever designed these digital controls should never hold another job. We have owned this oven for about six months now. It gets 5 stars for cooking. In conventional mode the temperatures are even side to side and almost even front to back, with the front being about 15 degrees cooler than the back at a 400 degree setting. Convection mode evens out that small differential. Convection cooking requires some time to get accustomed to the differences. Food cooks faster and the surface dries out more. Sometimes this is good, sometimes not. Toasting works only fair. Dry bread browns quickly and gets quite dark. Very moist bread only gets warm unless you extend the toasting time or toast something twice. We have baked with it and are happy. We have toasted with it and are merely satisfied. The oven is noisy. While the convection fan makes little noise, the heating elements appear to change length every time they cycle on or off. The unit sits there making fairly loud creaking noises the entire time it is in use. Great for halloween, but not the rest of the year. I opened the back and looked around. I could see no discernable sign of insulation. The top, sides and back get quite hot while the oven is in use. There are plenty of vent holes and slots which ventilate the case and prevent unsafe temperatures. Recommend that you do not let anything plastic sit nearby while the oven is in use - but - the oven makes a great plate warmer. The top is wide enough to set two 10 inch dinner plates side by side. The oven is a bit difficult to clean inside. One must be very careful not to tear up your cleaning cloth, leaving bits behind and be careful not to cut your hands or fingers on the sharp edges. All the members of our family give the user friendliness of the controls Zero points or stars. It seems to us that the controls were designed by a legal team who are very worried that the oven might actually get hot someday. In spite of reading the directions -- but not memorizing every exact step required to turn it on, we find that at least half the times we go to use the oven, we never actually turned it on. One has to program and press start on a microwave, apparently in a specific order. None of our other toaster ovens have ever worked like this. What ever happened to a dial for temp and a twist knob for time. These always seem to work. We will buy a cheaper and simpler oven next time. We own many other Oster items and are usually very happy with them. The company seems to make items which work wekk and are durable. We are hoping this oven fails in some way or takes a lightening hit. This oven has turned us off from buying with this brand name ever again or at least for a long time. If you like the controls, you will probably like the oven. If, like us, you don't, you will probably hate it. I like hearty whole wheat bread (Great Harvest variety) toasted until it is obviously browner. Most of the time the bread I toast is frozen. So, the toast cycle on this oven doesn't work very well for me. 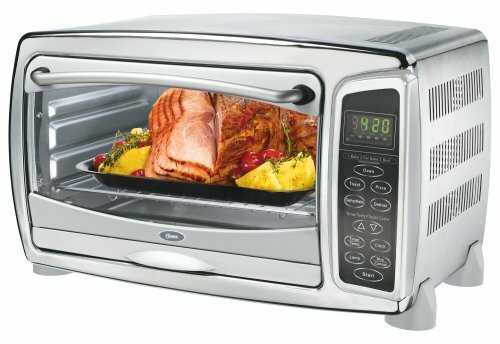 This unit also comes in all-Stainless color as newer model 6059 at Costco for $[...]. They even had $[...] off, so I paid $[...] and I claim it's better in features than Cuisinart models at 2X the price. 1) Has an oven light which the more expensive models don't have. 2) Has approx. 15% larger oven capacity than Cuisinart CTO-350PC. 3) Crumb tray slides out from the FRONT vs. the back. 4) The oven timer turns OFF the oven ! Gee what a nice invention. Maybe Oster should file a patent on that! until the 4-hour safety limit is up. is off... like like with electric stove top. walk over to the oven. Decent as an oven, worthless as a toaster. It made good toast, but was slow (over five minutes for medium). After six months of light use, the bottom burners completely stopped working. The model 6058 felt solid and looked nice. It's a real shame the electronics are shoddy. The price is low enough that having it repaired feels silly, but high enough I feel robbed by the short life. I decided it must be an oddball lemon, and bought another Oster (different model) and it was a complete pile of junk (I'll review the model 6078 separately). I had mistakenly thought Oster was made in the USA or Canada, but printed on the back: "MADE IN CHINA". This explains a lot. One last complaint: We burned ourselves repeatedly on this thing. There are design clues that lead a body to incorrectly think "cool to the touch", but instead bring blisters. 1. Fast, even roasting of 5-6 pound chickens, which fit very easily in the oven. 2. Frozen waffles came out great. 3. Meatloaves and roasted vegetables cook quickly and evenly. 4. Easy to clean and we especially like the crumb tray that pulls out from the front. 5. Superfast, no-hassle exchange by manufacturer right after purchase. We haven't called them about the latest problem because we've decided to get something else, so we don't know if they would be equally responsive 7 months later. 6. Great price for the size and features. 1. Poor durability, at least with the ones we got. 2. Toast takes forever and the countdown feature of the toasting timer doesn't kick in until the final minute of toasting. 3. Toast usually comes out pretty dry all the way through, even when we use the supposed optimal rack position per the instructions. 4. No indication when oven is properly pre-heated, you just have to guess more or less. 5. Very large and takes up a lot of space on the counter (but hey, we did want something big enough to hold a fairly large chicken. Bottom line, since we rarely make toast, and mainly bought it for it's roasting and convection features, we were very happy with it until the bottom heating elements died. But we don't plan to buy another one because we just don't trust their durability. If it had least at least one year I might've given it 3 stars, but since it barely lasted more than 6 months, I couldn't give it more than 2 stars. After doing much research, we purchased this toaster oven at Walmart. We've spent the entire weekend cooking and baking with it and have been surprised and thrilled by it. It does not heat up your house, it heats up faster than the huge kitchen oven therefore using less electricity, and it cooks faster and at a lower temp than usually called for. Important things to keep in mind if you are considering buying a toaster oven: 1) If you buy one, READ THE DIRECTIONS entirely - if you don't, do not complain because it didn't cook something perfectly. 2) After reading the directions, try out all the functions so you understand how to use them. And in my opinion these directions are just fine, btw. 3) For the first few times you use the oven, keep an eye on things! It's only common sense to do this so you get a feel for how the appliance operates differently from your old kitchen oven that you grew up with! and lastly 4) I highly recommend getting a toaster oven with the convection feature. It makes the heat cook more evenly, and though I have a microwave oven with a convection element that I've never used, I have used the one in my toaster oven and it works great. I think that you get what you pay for; that's why we did not purchase the cheapest one at the store - they feel flimsy and have no insulation - so no wonder there are so many bad reviews. This one is SOLID and even at 450 degrees I could touch the outside - but to be safe I do pull mine 6" away from the wall when using it (like it says in THE DIRECTIONS)! I also liked the digital display - especially after reading all the reviews where the knobs broke on other brands!!! TOASTS FAST AND BAKES FAST! GREAT PRICE! For those of you who said it takes too long to toast, I believe you are doing it wrong. Mine does a nice even dark toasting in around 2 minutes or less. You need to place toaster rack on the upper part of toaster and set the toaster level to darker toast.